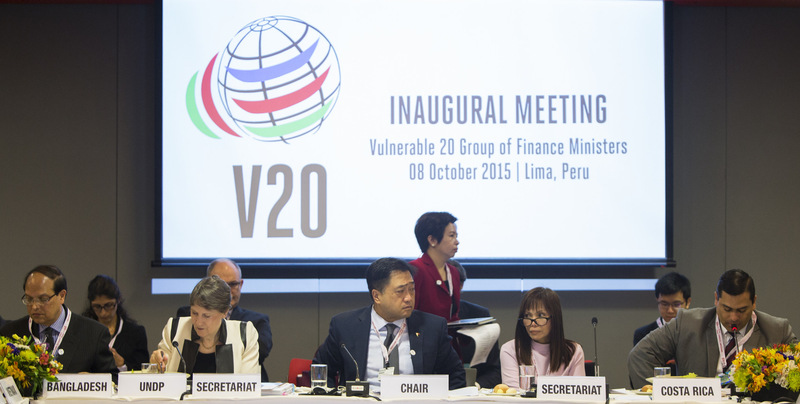 8 October 2015, Lima – Finance Ministers of the Vulnerable Twenty (V20), representing close to 700 million people threatened by climate change and spanning world regions, held their inaugural meeting on 8 October 2015 in Lima, Peru. They announced a series of actions to foster greater investment in climate resiliency and low emissions development at home and internationally. In its first statement the group called the response to climate change a “foremost humanitarian priority”, with the V20 committing to act collectively to “foster a significant increase” of public and private finance for climate action from wide-ranging sources, including international, regional and domestic mobilization. Finance Ministers decided to develop and apply innovative fiscal measures. They voiced support for an international financial transaction tax to aid the mobilization of additional resources for the fight against climate change. They also called for improved access to international climate change finance for adaptation and mitigation action, the fulfillment of the $100 billion commitment to the Green Climate Fund, and acceleration towards a 50:50 balance in resources mobilized given prevailing shortfalls for initiatives to adapt to climate change. Additionally, Finance Ministers agreed to establish a sovereign V20 Climate Risk Pooling mechanism to distribute economic and financial risks, enabling participating economies to improve recovery from climate-induced extreme weather events and disasters and to ensure enhanced security for jobs, livelihoods, businesses and investors. Modeled on similar regional facilities, the trans-regional mechanism would increase access to dependable and cost-efficient insurance while incentivizing scaled-up adaptation measures. Finally, V20 countries committed to develop or improve their financial accounting models and methodologies to enhance accounting of climate change costs, risks and response co-benefits in all their forms, while seeking a new international partnership to help realize the group’s aims. “Financial constraints put up serious barriers for climate action and expose millions to disaster and hardship. We believe the V20’s vision to deploy innovation in finance, based on shared experiences, has great potential to knock down such barriers” said Helen Clark, UN Development Programme (UNDP) Administrator. The V20 was created to promote climate finance mobilization; to share and exchange best practices on economic and financial aspects of climate action; to develop and implement improved and innovative approaches; and to engage in advocacy and other joint actions. A Working Group of the V20 commenced immediate follow-up to begin implementation of the first Action Plan, progress on which will be presented at the UN Climate Change Conference at Paris (COP21) later this year. The V20 statement said COP21 must deliver “an agreement entirely consistent with the non-negotiable survival of our kind,” while highlighting the significance of a strengthened below 1.5°C temperature goal. Afghanistan, Bangladesh, Barbados, Bhutan, Costa Rica, Ethiopia, Ghana, Kenya, Kiribati, Madagascar, Maldives, Nepal, Philippines, Rwanda, Saint Lucia, Tanzania, Timor-Leste, Tuvalu, Vanuatu and Vietnam are part of the V20 and the associated Climate Vulnerable Forum (CVF) that mandated the group’s formation.